Parking lot striping not only enhances the aesthetics of your property, but the overall appearance of fresh, clean and sharp striping makes your Atlanta based business look fantastic. When the exterior of your business looks good, people take notice, and your neighboring businesses will be jealous how great your parking lot looks compared to theirs. Not only is appearance important, but so is safety and compliance. When you keep your parking lot up to code, you are ensuring the safety of all the visitors and patrons to your business. There is a great responsibility of ensuring the safety of everyone using the parking area, and we are ready to make sure your lot exceeds expectations. When it comes to quality of work, we have all seen the parking area with crooked lines and botched stenciling. No one wants that type of job done to their parking lot. 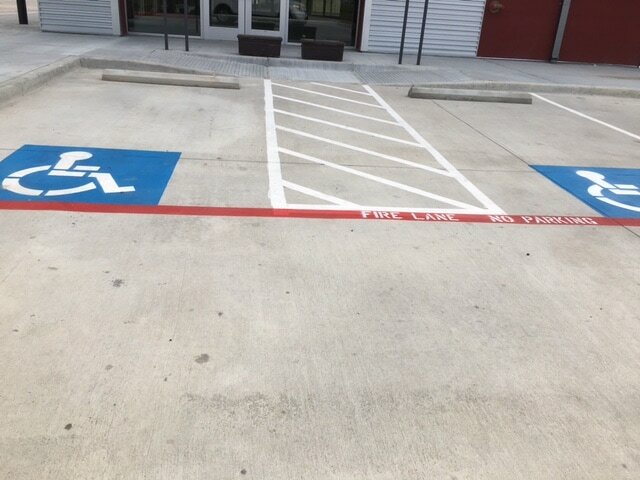 With our extensive experience and knowledge of striping, we pride ourselves in the fact that we paint the straightest lines in the entire state of Georgia. We also know through experience that using top quality paint and striping equipment is half the battle in producing excellent results. By using the best quality materials our striping stays uniform in color, as well as height and width. You will love the results and the way your parking lot looks by the time we are finished. 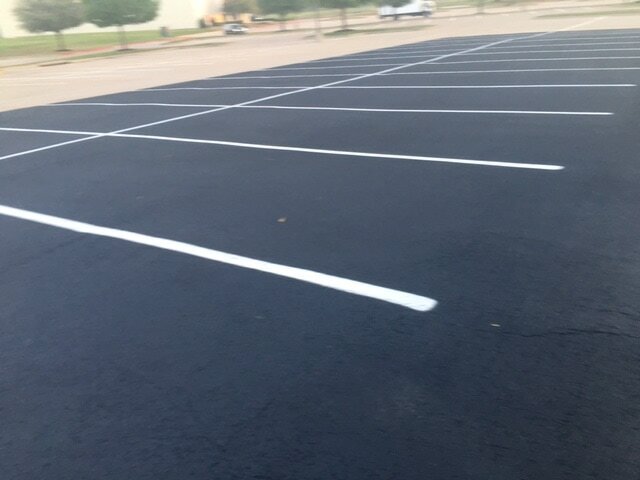 No matter if you have a concrete or asphalt parking lot, we are ready to assist you with all of your striping, compliance, and maintenance needs. Our crews are professional, prompt, and courteous and we treat your property as if it were our own. We know when you are looking for a striping contractor that finding the best in the business is sometimes hard to do, but pat yourself on the back because you just found your go-to parking lot maintenance company. We are a full-service parking lot maintenance company and look forward to providing you with every service needed for your parking lot. No matter if your parking lot needs full repairs, or you simply need a restripe, we can help. We know there is no job that is too large or too small for our crews to handle. Part of our excellent customer service is to ensure that our work does not stop the normal flow of traffic to your business. We will work out a time with you or your project manager for us to do the striping job during hours that will fit best. Although our high-quality paint dries quickly and allows for traffic to drive on it within 15 minutes after applying, we still need to make sure the lot is clear before we can start striping. If your lot is super busy we may need to schedule to come onsite after your normal business hours, or we may schedule multiple trips where we block off and stripe one-half of your lot, and the following day does the other side. Rest assured we will work with you to make sure we are striping without interfering with your business traffic. Used as a safety feature and also as part of compliance, wheel stops can help prevent a lot of damage to your property. Runaway vehicles can cause a lot of accidental damage to buildings, walls, vehicles, walkways, and any other structure that may be on the perimeter of your parking area. When you have car stops installed all of this accidental damage can be prevented. When installed properly in a parking stall, wheel stops should be completely covered by vehicles occupying the stall. They should also be well lit at night, as well as brightly painted to help prevent accidental tripping injuries. If you are in need of inexpensive curbing, wheelstops can also be used to set up a perimeter around the property, but you need to keep them clearly marked and painted to help prevent injury to pedestrians. It is somewhat that wheel stops are a safety measure, but can also be hazardous as well if tripped over by patrons to your parking lot. When it comes to choosing the type of wheel stops to install in your parking lot, you need to consider the types of traffic that will be occupying the lot. Normal cars and pickup truck type traffic will work great with concrete or rubber wheel stops, however concrete and rubber will fail and break easily when used for larger truck stops and tractor trailers. For larger truck traffic steel wheelstops are recommended. No matter the types of traffic and wheel stops needed our professional installers will properly install the stops in your parking lot. When was the last time you saw a speed bump? Probably very recent as these little guys are everywhere. They are everywhere for a reason, and that reason is for your safety. Speed bumps main purpose is to control vehicle speeds in your parking area or roadway. You typically will see speed bumps near crosswalks as well for good reason. Cars need to slow down when approaching crosswalks and other major pedestrian walkways. Our professional installers will help you with speed bump selection as you can choose from concrete, asphalt, rubber, or plastic. We are experts at installation, removal, and restoration. As part of the restoration, we will paint your existing speed bumps so that they stand out and are easily seen by drivers and pedestrians alike. Speed bumps can be a tripping hazard as well as cause major damage to vehicles if hit at a rapid rate of speed. 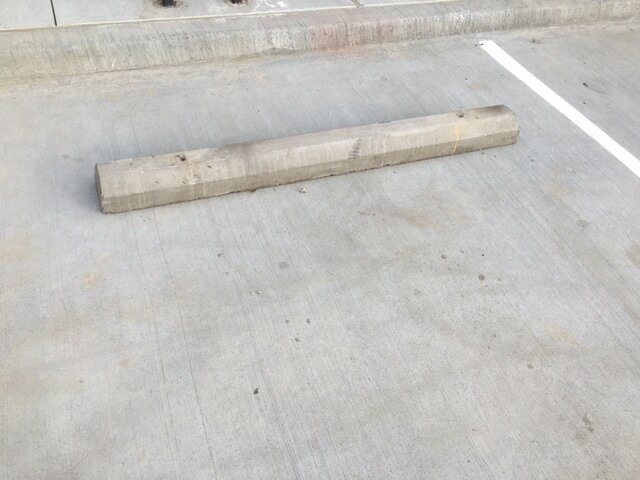 So as you can see this safety feature can turn into a hazard, however, the safety reasons typically outweigh the hazards, and thus worth installing in your parking lot. We will be glad to discuss all of your speed bump needs, simply give us a call today. Does your business need to have bollards installed in your parking area or around your business? We are professional bollard installers and we look forward to helping protect your property by installing bollards for you. Maybe you ran across our page, but have no idea what a bollard actually is, but I guarantee you do know what they are based on what they look like. These little guys are everywhere, and I know you have seen them before. 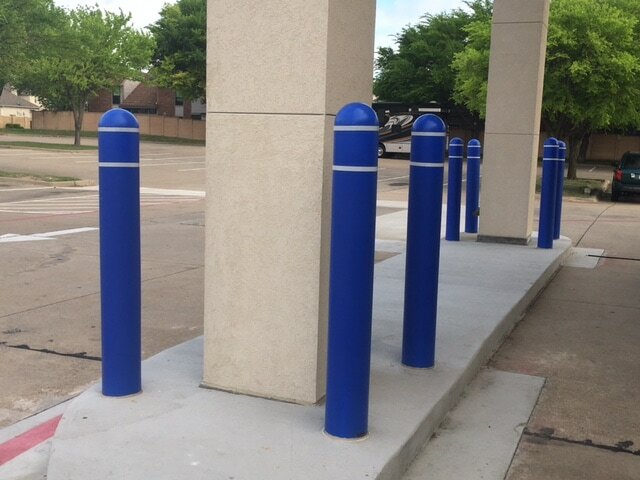 Bollards are short steel posts designed to protect your property from vehicle intrusions. 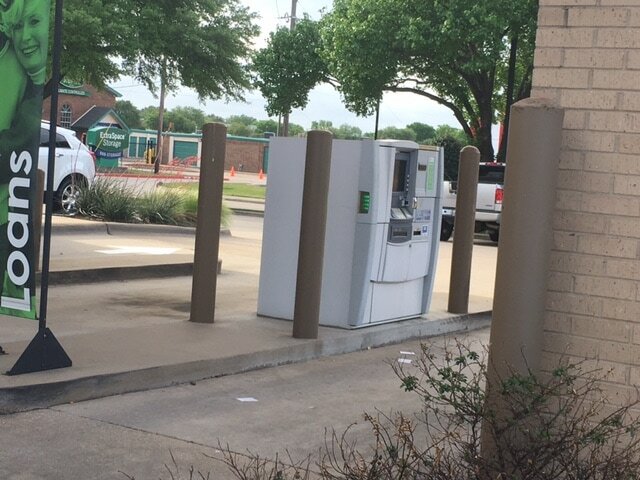 Most intrusions are accidental, so planning ahead and placing bollards in areas that are vulnerable to being damaged by a vehicle can save you a ton of money in repair costs down the road. Bollards can be made from construction grade steel, and then reinforced with concrete. This makes these poles very strong and a great protective barrier against accidents. Look around you will see bollards everywhere. They protect gas pumps, ATMs, utility poles, buildings, walls, ticket booths, fire hydrants, and so much more. Anything that is in or near your parking lot that may be vulnerable to accidentally being hit by a vehicle can be protected with bollards. You typically see bollards installed near crosswalk areas as well, to protect pedestrians once they have made it to the other side of the crosswalk. Bollards, can also be decorative and used in front of office buildings, or pathways. You can also get bollards installed with lights that may be powered by electricity or solar power. These lights on the bollards help to light up common areas, and pathways in the night. Our professional installers are ready to give you an expert installation of bollards around your property. The American Disabilities Act went into effect back in 1990, and all businesses are required to be in compliance. The ADA requires that your parking lot will have handicap parking stalls available, and the number of spaces that should be available will be calculated based on the size of your parking lot. Contact us, and we can let you know how many handicaps stalls your parking lot is required to have. We also have all of the proper ADA approved stencils to properly stencil the handicap logos in all your stalls. The stalls will require crosshatching, wheel stops, and proper signage as well. No need to worry about trying to figure out all of these requirements. 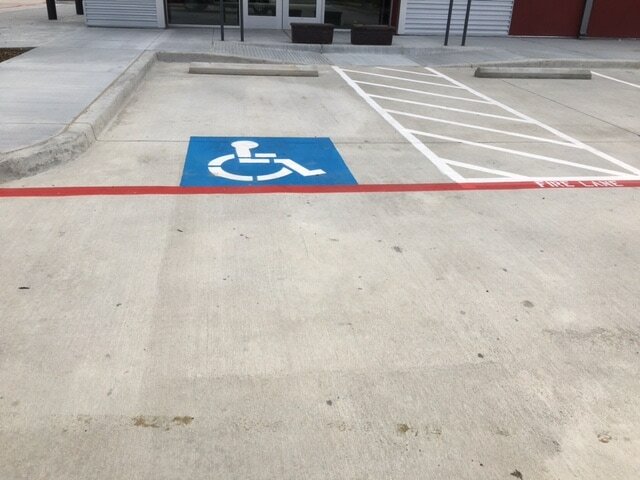 Our professionals have you covered, and will ensure your parking lot will pass all ADA required inspections. Contact us today for a FREE estimate on all striping and handicap compliance pricing. Providing proper access for Fire, Police, and Ambulance is important for everyone’s safety. 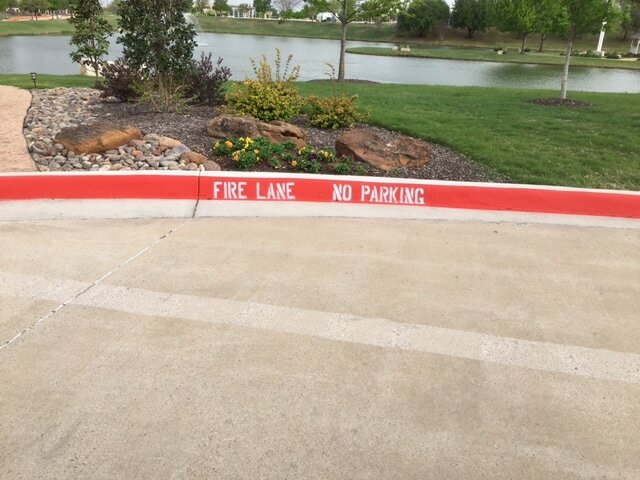 Having properly striped fire lanes with the words, “NO PARKING FIRE LANE” stenciled across the entire length of the fire lane areas is a requirement. There are many different codes and compliance rules that must be followed when striping a fire lane area. Never fear our professional line stripers are up-to-date on all of the different code requirements. By having properly striped fire lanes you not only stay in compliance but are assuring the safety of everyone. Fire emergencies happen fast, and being ready for emergency vehicles in your parking lot is a great importance. There is no question about it, asphalt surfaces will require regular maintenance to stay long lasting. Applying a sealcoat every few years will help to prolong the life of your asphalt and make it last a very long time. A seal coat is a top layer of protection for the asphalt which will seal up tiny cracks, and also help to weather proof the surface. This weatherproofing will prevent oxidation and deterioration. This top layer of sealcoat also becomes the wearing surface that will break down under the moving of vehicle tires over time. This breakdown is called abrasion. The good news is that as the tires turn on top of the sealcoat and the abrasion occurs, the asphalt below the seal coat remains untouched, thus lasting a much longer time. After a few years of abrasion, the sealcoat will need to be reapplied to continue adding protection for the asphalt. As you can see you cannot afford to fail to do proper maintenance on your asphalt, otherwise you will be faced with a very large asphalt repair bill in the near future. Maintenance is so much less expensive than a full repair of the asphalt surface. ​We have striped many businesses around Atlanta, GA, and surrounding suburbs. If you have a parking lot, warehouse, or some other need for striping or stenciling, we will be glad to assist you. Here is a list of common places we stripe, but keep in mind we can't list every business, so if you do not see your type of business no worries, we can still assist you too. ​We pride ourselves in having the most competitive pricing in all of Atlanta. We will be glad to give you a free quote for your project. We will need to know how big your parking lot is and how many spaces will we be striping. We will also need to know things like how much fire lane do you have if any, how many handicaps spots you currently have, will you be needing wheel stops, speed bumps, bollards, crosshatching, or any other types of signage or services. 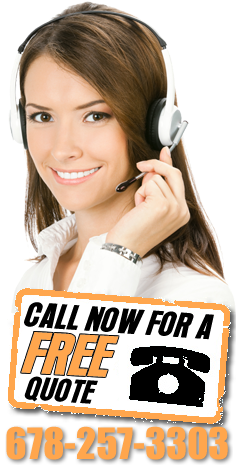 Once we are able to get a full list of what all is needed, we will be able to give you an estimate for FREE. We want to earn your business, and we look forward to becoming your full-service parking lot striping and maintenance company.